Guruvayoor is one of the most popular pilgrimage destinations in South India. It is well connected by rail and road to Thrissur and hence to the rest of the country. Guruvayoor enshrines the youthful form of Krishna. This is a temple rich in legend, tradition and festivals. Legend has it that Guru - the preceptor of Gods (Brihaspati) and Vaayu the wind God established this temple. Legend has it that this image was originally worshipped by Bhrama and gifted to Vishnu who retained it with him at Dwarka during his Krishnavataram. At the brink of destruction of Dwarka, Krishna instructed Uddhava to seek Vayu's and Guru's help to find a safe haven for the image. Accordingly Guru and Vayu installed this image at Guruvayur, on one side of a lotus lake, on the other side of which was a shrine to Shiva and Parvati. It is believed that worshipping here relieves people of bodily ailments. Legend has it that Janamejaya, son of Parikshit was cured of leprosy upon installing the image of Krishna and worshipping here. Yet another legend has it that a Pandya King was cured of a snake bite while worshipping here. History: The famous work Naaraayaneeyam - authored in the 16th century was composed in the presence of the presiding deity here, and its author is believed to have been cured of an incurable bout of arthritis. At the time of the political turmoil that prevailed during the period of Tippu Sultan, the image of Krishna was taken to Ambalapuzha for safety and worshipped there for a period of 2 years. It was then brought back in 1789. The temple: The temple faces east. Crowds throng the entrance, and are let in through a queue system. The sanctum can be viewed from the temple entrance. There are also shrines to Durga (Edathidettukkaavu Bhagawati), and Sastha here. Worship: It is believed that Aadi Sankaracharya set up the worship protocol here. The Nirmalya Darisanam is celebrated in the pre-dawn hours (3 am). The sanctum closes at 9 pm, and it stays open throughout the day except for a break between 1pm and 4 pm. A series of worship services are conducted throughout the day. A festival image of the deity is carried in procession around the temple during various rituals. Worship at Guruvayur is considered complete after visiting the Mammiyur Mahadevar temple nearby. Festivals: The mandala ulsavam is celebrated for a period of 41 days towards the end of each calendar year. 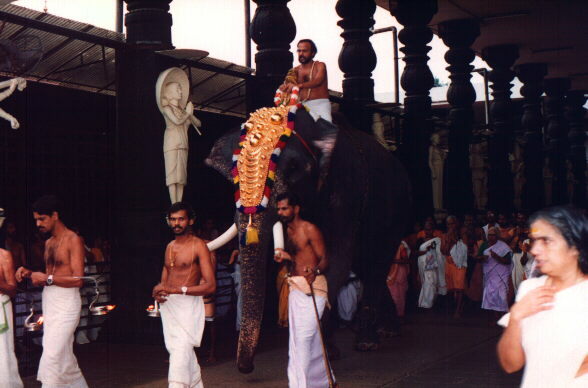 The annual ulsavam or festival is celebrated in the month of Kumbha, and this festival concludes with an elephant race.